JONATHAN: So how do you get your scripts? You haven’t written them all yourself, have you? RANDY: Oh, heavens no! We’ve had a lot of submissions from writers over the years. In fact, we have a writer’s bible online for people to look at. It listed the characters for a while, but we had to remove the cast of characters because we don’t know who’s coming to an episode until three weeks before we film. JONATHAN: And you don’t know that because…why? The kids don’t know their schedules? RANDY: Yeah. Paying gigs come first. Family comes first. Half of them get cast in various productions around town. JONATHAN: So what do you do? Do you just put out a call to all of your actors and see what happens? Rachel Riemke in the center seat of the new bridge set in the third season episode “Third Watch”. RANDY: I post it on Facebook: “I need to know who is available for this shoot.” And from their responses, I create a spreadsheet. The spreadsheet then tells me if I have enough people. And if I don’t have enough people, I contact Deborah and say, “I need more people” (if it’s helm and navigators or security). If I need older actors, I call Mark. If I need somebody really good, I call Jeff. Although Mark gave me Rachel [Riemke], the lieutenant who’s in command in the episode “Third Watch.” Now, that girl can act! I have never seen a person take a page of technobabble, and in just three weeks of preparation, give me a perfect performance. She was so good that everyone was getting mad at themselves for blowing their lines after she was giving hers. She showed up a bunch of people, and you know, there’s nothing like an actor having his performance overshadowed by another actor’s. JONATHAN: So once the actors commit, are they pretty reliable about showing up when they say they will? And so I changed the character’s name to T’Nosho in the script, and Jeff says, “That’s funny, but you can’t do that. It’ll be too distracting. Let’s make it T’Noshi,” and I said, “Okay.” So Jeff not only cast the character, he named the character, and he got the girl, Christin Woods, who’s one of his grad students, to come over there and shoot with us. 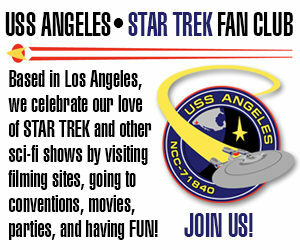 JONATHAN: Was Christin at least a Star Trek fan? 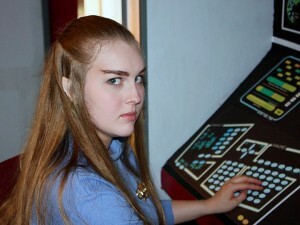 ‘Cause it’s not easy to play a Vulcan if you aren’t familiar with them. Christin Woods as the Vulcan Ensign T’Noshi. RANDY: She wasn’t familiar with Star Trek when she first showed up to help us film, but Chrstin’s daddy was a Star Trek fan, and they sat down and watched a bunch of Vulcan episodes, and that’s why you see a progression in her character from her first appearance in “The Night the Stars Fell from the Sky” to her next appearance in “Holding Pattern.” She’s watched it now. JONATHAN: Getting back to the scripts, what is the process you go through? You let people submit story ideas, and then what? RANDY; David Eversole is our story editor, script supervisor… anything that has to do with the scripts, we hand to David. Years ago, he was invited to pitch to Deep Space Nine, and he went out there and pitched. So I have a completely professional writer who has looked over our scripts. I wrote and edited fan fiction for 35 years, so I can take a story and tell you in five minutes whether it’s going to work or not. David then takes the story, and he takes a pass-through of it, so to speak. Then I take a pass-through and give it back to him, and we pass it through until both of us are perfectly happy with it. And then we have a story. The stories, they need to entertain us. If they don’t entertain us, I’m not interested. I work on about 18 scripts at any one time. 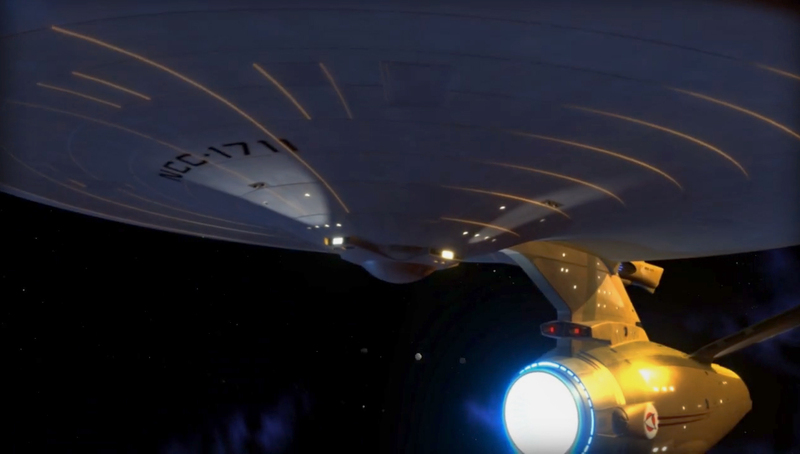 Lots of fans say they want space battles, but those aren’t usually good stories, just fights. You know how many battle stories we’ve had submitted to us over the years? Good God, I can’t even count! It’s gotta be at least three dozen! JONATHAN: And how many battle scripts have you actually shot? RANDY: Two… one in the second season, and one in the third. One with the Orions and one with the Romulans. 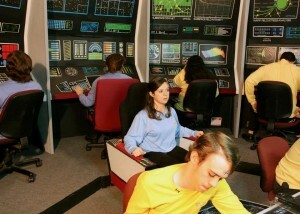 We haven’t even fought the Klingons yet! JONATHAN: Now, I know you’ve written a fair amount of the scripts yourself. Where do you get your ideas? RANDY: Oh, it can be from anywhere or anything or anyone. One of the scripts that we wrote was “Archway,” and I wrote it back in 1977 as a fan fic, and I could never make it work on paper. And yet we were able to make it work as a fan film. Another script, “Ashes,” I wrote while eating lunch at a Long John Silver’s. I was sitting there eating my three pieces of fish and my order of clam strips, and this guy outside just kinda falls down. He had a heat stroke. And everybody’s rushed over there and helps him up. And then another person falls down from heat stroke. And then it dawned on me: what if they all fell down? I had “Ashes” written in about 20 minutes on a paper napkin from Long John Silver’s. JONATHAN: So about how long does it take you to film an episode? RANDY: That depends a lot on the length of the script. If it’s seven pages, it’s usually seven hours. If it’s three pages, it’s three hours. Our second kinda-crappy episode, “Care for a Lift?” was filmed in a side closet off the carport with a turbolift background, and it was shot in 109 degrees. We were under two 1500 watt lights, and you can see the sweat pouring off me in those scenes. And we filmed it all in two hours, maybe three. Our third episode, “The Void,” when we filmed it, it was 115 degrees in the carport, and we shot it over two nights. We overcooled the house and had fans blowing air in from the kitchen. And when actors weren’t filming, they were expected to be in the house cooling and hydrating themselves. 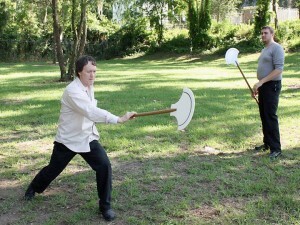 Staging a Vulcan lirpa battle outdoors during a Georgia heat wave. Our longest episode, “The Night the Stars Fell From the Sky,” [which is 54 minutes long -Jonathan] took us nineteen weeks to shoot, but we had a limited window to film each day. We usually shoot an episode between 9 and 4 on a Saturday. But with that particular episode, we filmed two days a week, Friday and Saturday, from 8am until 11am only. By noon, it just got too hot. We had a call time of 7am to do the ears on all the Vulcans, but we essentially had just three hours per day to film. Albany was experiencing a drought. The swamp we were filming in actually dried up while we were filming. That alien planet where they’re walking down the riverbed, that whole area is usually four feet underwater. That’s why it looks so cool and alien. JONATHAN: Including the actors, how many people work on each episode? RANDY: Well, there’s the director, who is usually also the cameraman but not always. The sound person, who is a new person because, for a while there, we didn’t have sound equipment. Then we found a $300 piece of equipment on Amazon.com for $45 ’cause the guy didn’t like it. So we got it. Let’s see, we’ve got a boom guy now, we have one person who does lighting and electrical — so what is that? — a grip and a gaffer combined. Then we have a script person, so that’s five or six. Plus the cast, and the cast can range from four to twelve in a typical episode. JONATHAN: Of course, you also have to edit each episode, right? RANDY: I edit and Rick Foxx edits, so we have two editors who work on two episodes concurrently. JONATHAN: How long does it take you and your other editor to finish editing an episode? JONATHAN: Of course, there’s also the music. Personally, I think your music is fantastic. Who’s your composer? RANDY: Both of our music guys, Tony Lunn and Steve Gallant, are musicians in Great Britain. I found them both through referrals. JONATHAN: And they write a different musical score for every episode, right? I mean, each episode sounds different musically… except for the opening and closing credits. RANDY: Yes, each episode has its own score. JONATHAN: And how long does it take to score an episode? RANDY: About one week for Tony. Steve might take a month, but you couldn’t tell if it took a week or a month, both of them do such a good job with it. JONATHAN: And then there’s special FX? RANDY: That can be our weakest link. The battle sequences for “Third Watch” took three months to do 16 visual FX shots. JONATHAN: And who is doing your visual FX? The visual FX have improved with each successive season. RANDY: Chris Cameron, who lives in Nova Scotia and is a movie theater manager when he’s not doing VFX. Another one is Mark Berge, and he lives in Reykjavik, Iceland. He’s a web designer, developer, and animator. And we’ve got one other, Chris Kroznuski, and Chris Cameron brought him in. These guys all do the space FX; Rick and I do the panel animations, the blinking lights and stuff. I usually let Chris Cameron have the first choice of assignments, then Mark chooses, and Chris Cameron usually gives the other Chris his assignments. JONATHAN: So how long does it take to create the FX for a typical episode (not a really FX-heavy one)? RANDY: Two to three months. So if you divide that by two to three guys, they’re able to keep up with one a month. JONATHAN: Are you paying them at all? RANDY: No. Everyone works on Project: Potemkin for free. JONATHAN: Have you ever considered crowd-funding? RANDY: A few years ago, out of the blue, I received a letter from CBS telling me to take the Paypal link down from my website, so I did. JONATHAN: How many donations did you get? RANDY: None. We had no donations, period. Nowadays, though, I’m allowed to say on Facebook, “Guys, I need help. We need some paint, and it’s going to cost me about $230 from Lowe’s. Can anyone help me cover the cost for this paint?” And within three hours, I have plenty of people who have given me money. People send the money to the old Orion Press Paypal account, but it all goes to the same place. I’ve done that maybe four times over the past year, and it’s for things like lumber, paint, and the next one will be for carpeting for the starship… gotta have carpeting! JONATHAN: That reminds me, you’re no longer filming in your carport, are you? Potemkin moved to a studio, right? How and when did that happen? RANDY: In 2013, I sold my print shop. But the taxman cometh, so I opened up a new business called Stellar Video Services and pumped the money into a studio… that just happened to have some Star Trek sets in it when I was finished. I would also make commercials for four of the local TV stations, and I pretty much broke even. But then my wife got a job offer in Birmingham, Alabama, so I shut down the studio and we moved there. But it was too far for most of the Potemkin cast to want to travel to. 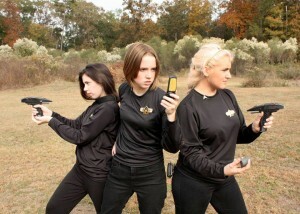 So we decided to wrap up the series and just filmed our finale. When we moved, we bought a house with a large basement and a detached boathouse, and I’m building new sets in them for four new series. I’m not going to do nearly as many episodes of those as we did for Potemkin, but I’m still excited by how things are working out. I’ve got a couple of my old actors willing to make the 240-mile drive from Albany, and I’ve been in touch with some local Alabama Trekkers who were involved with a fan series called Starship Lexington, and they’re gonna come over and shoot. And I contacted a few local actors in Birmingham, and I’ve got appointments with the drama departments of four colleges within about five miles of me. 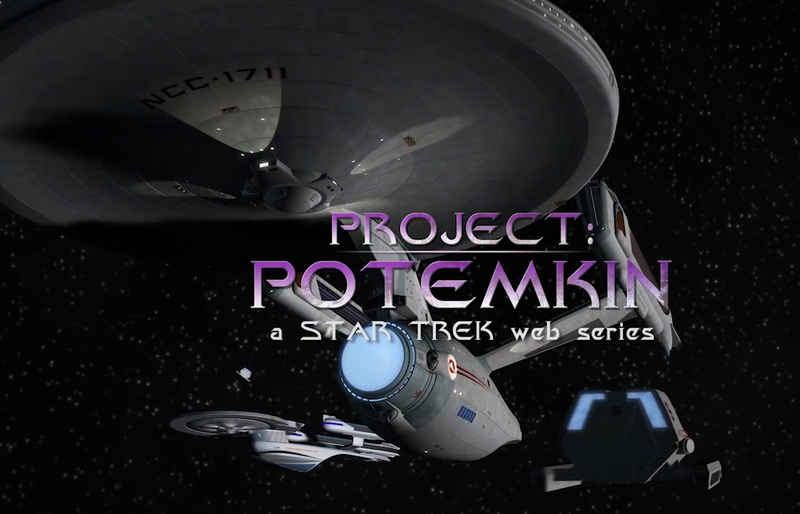 Project: Potemkin is like box of chocolates: you never know what you’re gonna get. JONATHAN: Well, it’s good to know that you’ll still be entertaining us fans well into the future. We’ll have to check back with you here at Fan Film Factor blog when your next series launches. In the meantime, I have one final question. The closing credits of each episode say “For a Spoonful of Borscht.” It’s even written on the dedication plaque on the wall of the bridge on the USS Potemkin of your series. What does it mean? JONATHAN: Whew! That was a really great interview, Randy. Thanks so much for taking the time to chat with us, and we wish you the best of luck with the remainder of Project: Potemkin and with your upcoming new series. 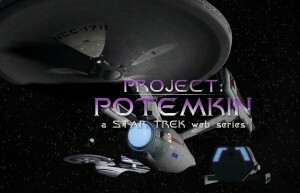 Check out Project: Potemkin episodes online here. There’s a LOT to choose from, but the best ones (according to both Randy and me) are “Third Watch,” “Ashes,” “Command Decision”, and “Holding Pattern.” Each is a HIGHLY RECOMMENDED +.